When I started posting pioneer obituaries under the heading “Passing of the Pioneers” in July 2011, I never imagined that “Passing of the Pioneers” would still be going three years on. (I didn’t think Western District Families would still be going). Nor did I expect that I could announce this month marks the posting of the 500th pioneer obituary. Over the three years, thanks to the stories of those 500 pioneers, the amount I have learnt about Western District history and the families who built that history has been invaluable. However, the best aspect has been the number of people who have contacted me after finding their pioneering ancestor in the posts. I hope what I have provided has gone a little way toward them learning more about their ancestors’ lives. The precis I give for each pioneer summarises the obituary that appeared in the paper when the pioneer passed away. I don’t check the facts written there, such as ships sailed on or years of arrival. I do search for the maiden name of married women, simply because I prefer to list them with their maiden names and not Mrs A. Smith, for example. Sometimes I will search for further information about a pioneer and in the entry I include links to the sources I have found. So basically, what I give you is an index to pioneer obituaries with a link to the original and from there you can make what you like of the information provided at the time of the pioneer’s death. Obituaries are, after all, an inaccurate source as the information contained is second or third hand and rarely do you read of negative characteristics of a person or their failures in life. Importantly, I must thank Trove Australia because without the digitised newspapers I would never have been able to find the 500 obituaries of some of the Western District’s great pioneers. You can either search or browse the Passing of the Pioneers obituaries. Search a family name in the search box on the side bar of this page or select “Pioneer Obituaries” in the category box, also on the sidebar. You can then browse through the 36 posts beginning with the most recent. Simply click on the name of the pioneer to go to the newspaper obituary. If you find a family member, feel free to comment and give more information if you have any. Leaving a comment increases your chance of finding someone else researching the same person. This month’s pioneers include two men who knew family members of mine with both men being important figures in their respective towns. There is also a bricklayer, a publican and one of the men who discovered the Londonderry mine at Coolgardie, Western Australia. Hugh MURRAY: Died 28 July 1869 at Colac. Hugh Murray was born in Scotland about 1814 and arrived in Tasmania with his parents and siblings in 1823. 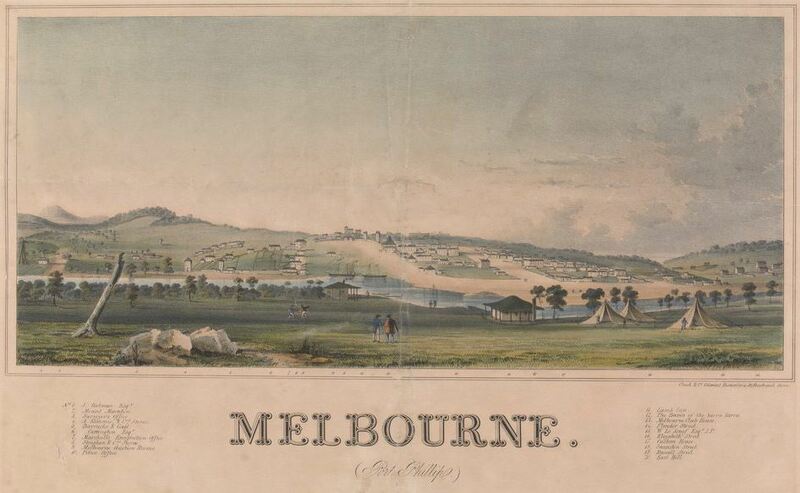 At the age of twenty-three, Hugh left Tasmania for Victoria and settled on the banks of Lake Colac before there was a town and today is considered Colac’s first white settler. 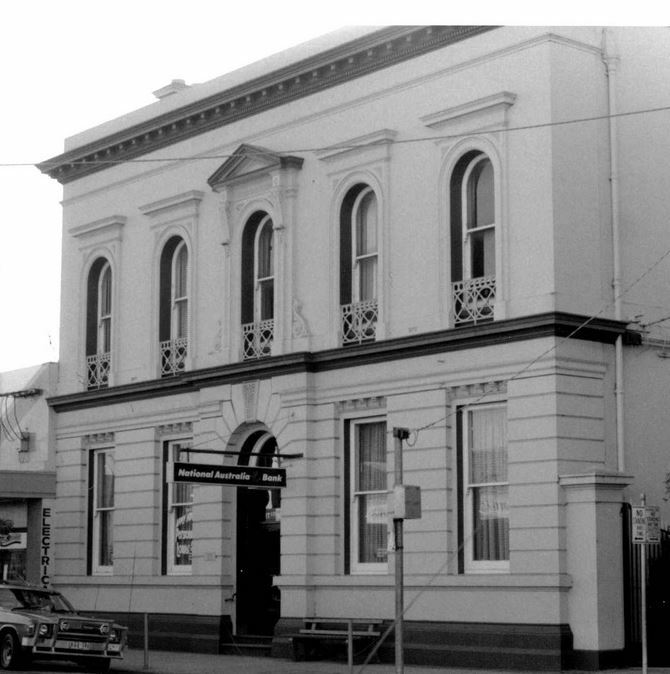 Hugh had pastoral interests but also sat as a Magistrate at the local Colac Magistrates Court. Last month’s Passing of the Pioneers included the obituary of Elizabeth Young of Hobart who married Hugh Murray in 1841. Hugh knew my ggg grandparents Thomas Gamble and Ellen Barry but not in the way one would like their ancestors to be acquainted with an outstanding citizen of Colac. It started with Thomas Gamble, said to have been employed by Hugh Murray to make bricks for his new home at Lake Colac, thus prompting the Gambles to move from Geelong to Colac. Their relationship soon soured. As early as 1851, Thomas’ wife Ellen faced Magistrate Murray in the Colac Court of Petty Sessions charged with drunkenness, one of dozens of charges she would face during her life and it certainly wasn’t her first. In January 1853, Thomas Gamble faced court as the defendant in a case against Hugh Murray. Although the handwriting in the original register of the Colac Court of Petty Sessions (p.83) is difficult to read, I can make out the words – “Thomas Gamble – Charged alleged arson in setting fire to Hugh Murray Esq.”. Fortunately, the case was dismissed. 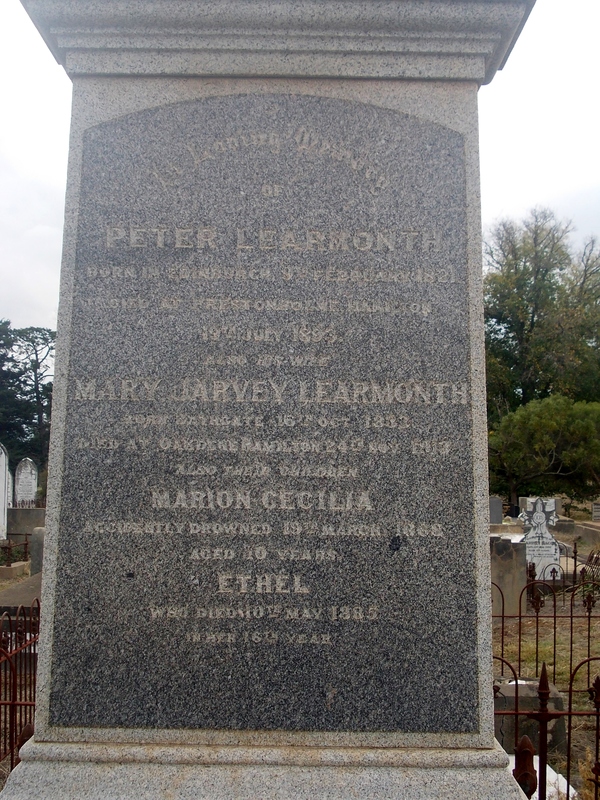 Peter LEARMONTH: Died 19 July 1893 at Hamilton. 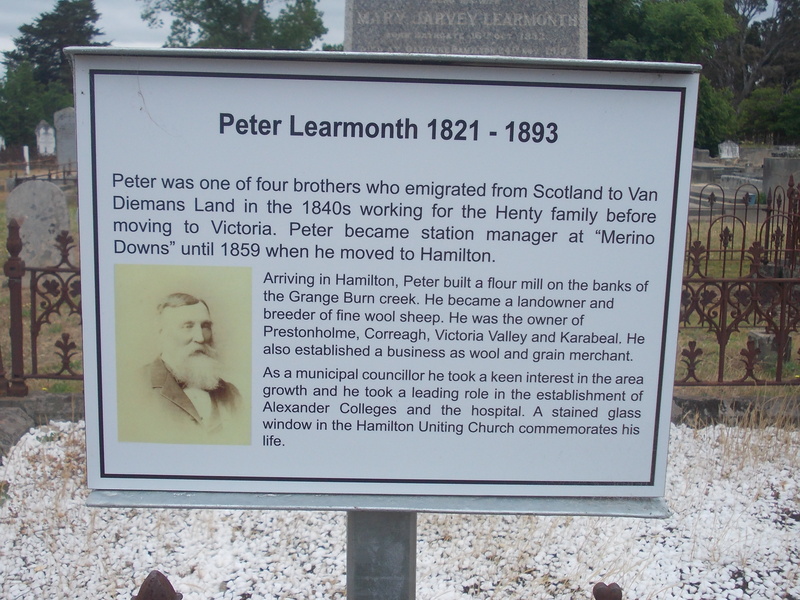 Peter Learmonth was one of Hamilton’s most prominent citizens from the 1860s to the time of his death, contributing greatly to the growth of that town and the villages surrounding it. Born in Scotland in 1821, Peter travelled to Tasmania to meet up with his brother William who had already bought land in that colony. Gold attracted Peter and he left for the Californian goldfields in the late 1840s. With no success, he made his way to Victoria in the early 1850s and had good fortune on the Castlemaine goldfields. 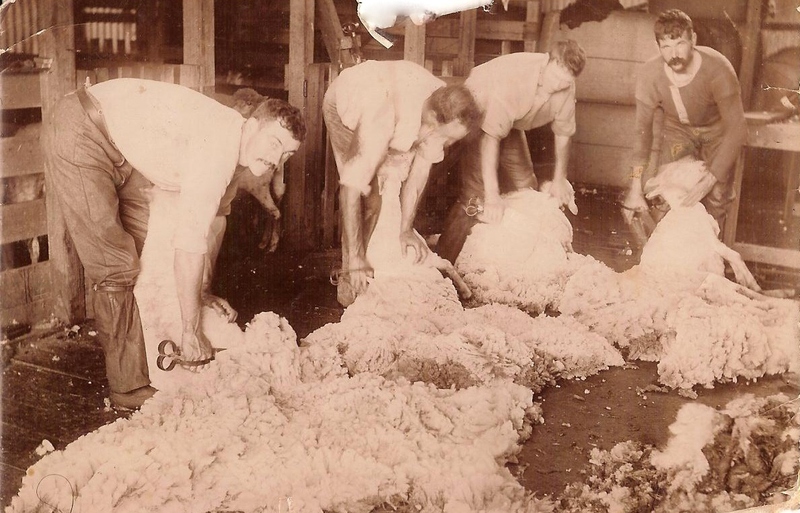 Getting out while ahead during the mid-1850s, he took up a manager’s job at Merino Downs station owned by Francis Henty, but not before marrying Mary Jarvey Pearson at Portland in 1854. 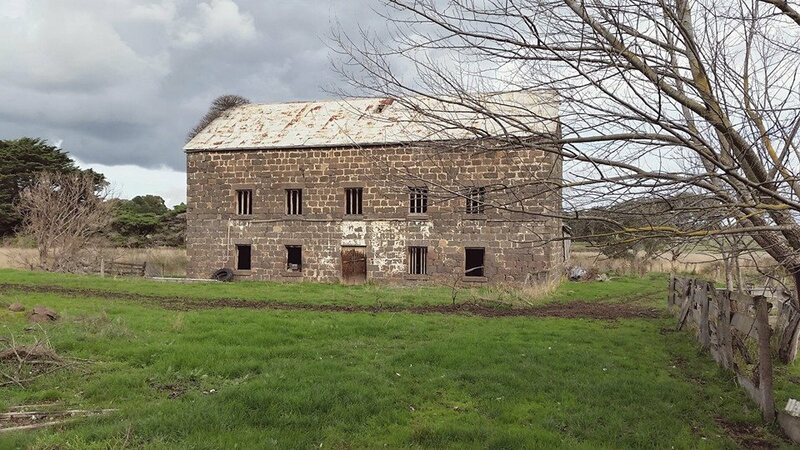 By 1859, Peter purchased Prestonholme on the banks of the Grange Burn near Hamilton from George Younger and proceeded to build the Grange Burn Flour Mill. He later purchased mills at Byaduk, Sandford and Penshurst. The homestead at Prestonholme and the mill still stand today on the Mill Road, Hamilton. PETER LEARMONTH’S GRANGE BURN MILL. Photo courtesy of Denis Steer. 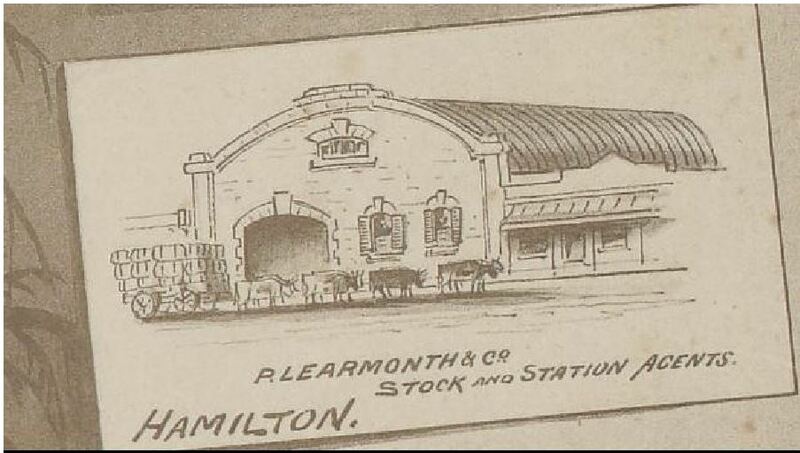 Not satisfied with his milling empire, Peter established P.Learmonth & Co Stock & Station agents in Gray Street, Hamilton. Peter’s sons continued the business after his death. Peter Learmonth was a member of the Dundas Shire Council for nine years, serving as President for four successive terms, a record he still holds. He was also one of the first councilors of the Borough of Hamilton. Peter was one of the driving forces behind the Hamilton & Western District Boys College and Alexandra Girls School, two schools that built Hamilton’s foundations as an education town. The Hamilton Hospital was another of Hamilton’s institutions that Peter Learmonth helped set up and was President of the Hospital for eighteen years. Two of Peter Learmonth’s children married into families that were also influential in Hamilton ‘at the time. Eldest son James Allan Learmonth married Annie Thomson, daughter of John Thomson of Monivae in 1886. A daughter Mary married the son of another prominent Hamilton man, David Laidlaw jnr, son of saddler and self-made man, David Laidlaw. Mary’s obituary appeared in April 2013 Passing of the Pioneers. Messrs. Learmonth, Laidlaw and Thomson were a force to be reckoned with and include Peter’s brother, Alex Learmonth, also a man of much influence, and it is not surprising that they were able to grow Hamilton into one of Victoria’s most eminent towns. Later in life, Peter purchased land in Mexico and gave his share to two of his sons. He also purchased Correa Estate” near Dunkeld and pursued pastoral interests with much success. A supporter of the temperance movement, Peter was president of the Total Abstinence Society and the work of he and John Thomson, saw a Temperance Hall opened in Kennedy Street, Hamilton. They obtained an existing building and converted it to suit the needs of the Society. As I write my Harman family history and delve into the local histories of Byaduk and Hamilton, Peter Learmonth comes up time and again. A Methodist, he knew my ggg grandfather James Harman and at one stage James was acting as an agent for farm machinery on Peter’s behalf. James’ daughter Julia married George Holmes Jnr, the son of George Holmes who was a manager of the Grange Burn mill before managing the Byaduk mill. George Jnr worked at the Penshurst mill and took over the Sandford mill with his brothers. Peter Learmonth passed away at his home at “Prestonholme” . He was seventy-four. Peter was buried at the Old Hamilton Cemetery. GRAVE OF PETER LEARMONTH, OLD HAMILTON CEMETERY. With his prominence with the Methodist Church, a memorial window was unveiled at the Hamilton Wesleyan Methodist Church in McIntyre Street on Sunday 7 January 1900. 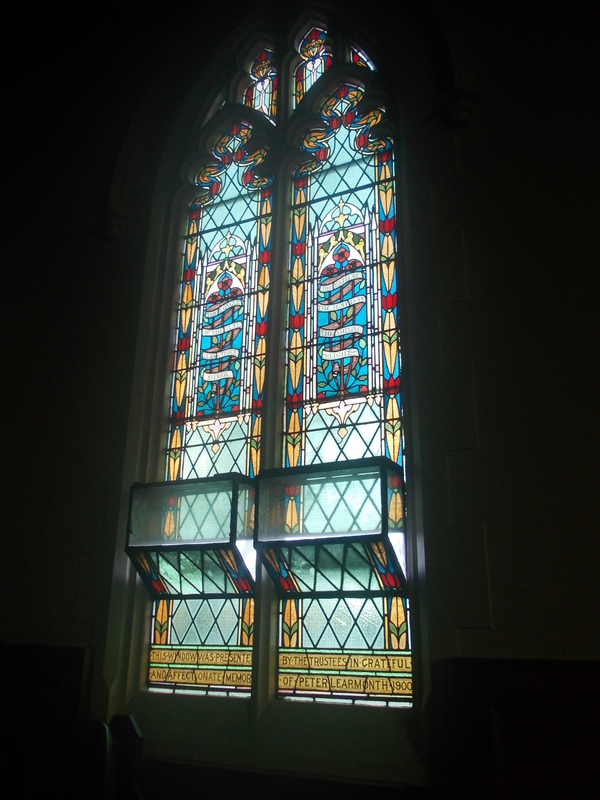 A new Methodist church was opened in Lonsdale Street, Hamilton in October 1913, and the window was installed there. Dundas Shire Centenary, 1863-1963. Hamilton Spectator for the Dundas Shire Council, [Hamilton, Vic. ], 1963. Garden, Donald S. (Donald Stuart) and Hamilton (Vic.). 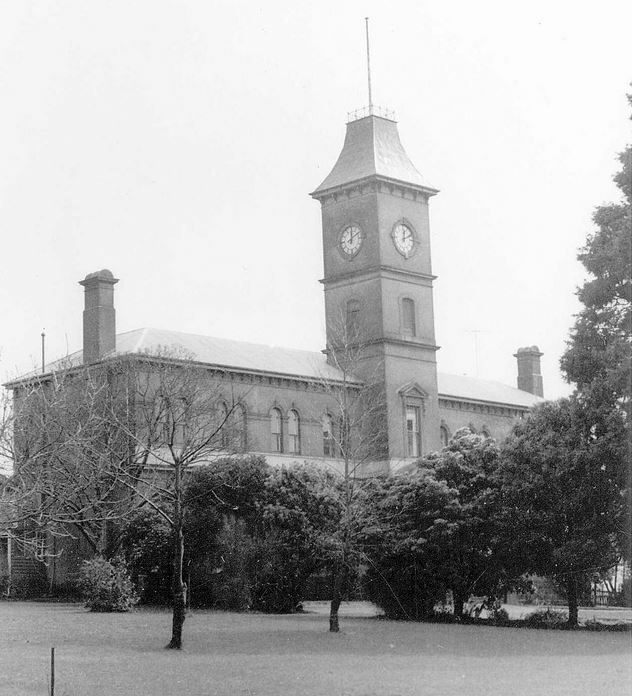 Council Hamilton, a Western District history. City of Hamilton in conjunction with Hargreen, North Melbourne, 1984. Macdonald, Anita Mariposa : a story of the Learmonths of western Victoria and Mexico, 1834-1930. Heatherleigh Publishing, [Melbourne], 1982. John SYMONS: Died 10 July 1914 at Hamilton. Born in Cornwall around 1828, John Symons’ trade was ship’s carpenter and after his arrival at Portland in 1854, his skills were in demand with much building work required. 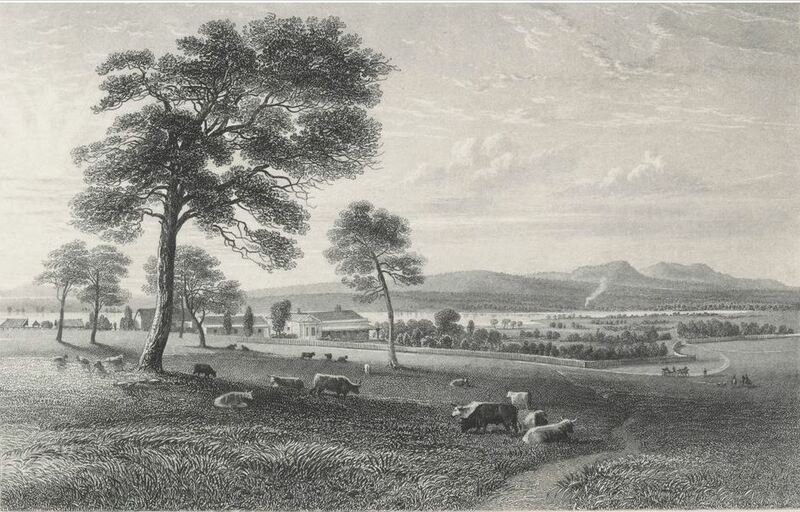 From Portland, John moved to Balmoral before settling at the Wannon, near Hamilton. John farmed but was also a contractor for the Roads Board and later the local Shires. One of his most important works in the district was constructing the bridge over the Wannon River at Redruth, a necessity to enable travel from Hamilton to Coleraine and beyond. Timber for the bridge was cut using pit saws and John did much of that work himself. During his marriage, John and his wife raised eleven children with seven still living at the time of his death. William DUNN: Died 1 July 1914 at Box Hill. William Dunn arrived in Victoria in 1855 from Somersetshire aboard the Raven’s Craig. After two years in Geelong, he rode by horseback to Hamilton, his home for the next forty-four years. As a bricklayer and builder, he constructed the Victoria and Colonial banks in Hamilton with William Holden and Budock Vean, a home in French Street, Hamilton still standing today. A devout Methodist, he held various positions within the church. Jane DONNELLY: Died 1 July 1914 at Hawkesdale. Born in Ireland around 1834, Jane Donnelly arrived in Australia in the 1860s, settling at Myamyn. She married William Walshe and they raised six children. In the meantime, Jane established the Foresters Hotel at Myamyn and ran a store to cater for the many carriers who used the town as a stopover on their travels. After the death of her husband, Jane remarried to William Jenkins in 1883 and for a time ran the former Victoria Hotel at Portland. John MUNRO: Died July 1914 at Hotspur. John Munro was born in Scotland around 1833 and sailed to Hobsons Bay aboard the Champion of the Seas in 1854. Gold must have been his primary reason for coming to Victoria as he spent time around the various diggings before travelling to New Zealand and the goldfields of Otago. After two years, he returned and took up residence at Portland and married in 1867. For many years, he was a storekeeper and post office operator. He also engaged in farming pursuits and in the early 1890s took up land at Hotspur. At the time of his death, he left a widow and nine children. He was buried at the Hotspur Cemetery. Alexander John McLEAN: Died 23 July 1915 at Hamilton. Alexander McLean was born in Scotland around 1836 and arrived in Sydney as a three-year-old with his parents. They later moved to Victoria, taking up residence at Tower Hill. From there, Alexander went on to Myamyn and then Macarthur where he was a founding member of the Methodist Church. Alexander enjoyed telling stories of the pioneer days, before bridges spanned creeks or railways traversed the countryside. Alexander and his wife had nine children. Sarah Ann FARNHAM: Died 21 July 1916 at Hamilton. Born in Somersetshire, England around 1839, Sarah Ann Farnham arrived at Portland in 1858. She married Andrew Lockie at Portland in 1860 and by 1866 they had moved to Hamilton were Andrew ran a saddlery business. Leaving a family of six children and her husband, Sarah Ann was buried at the Hamilton Old Cemetery. Mary SAVIN: Died July 1918 at Muddy Creek. Mary Savin was born in Oxfordshire and sailed to Victoria with her parents in 1853. Around 1855, the family travelled north to Muddy Creek where they settled. Two years later, Mary married John Addinsall and they had a family of twelve children. Like many of the early settlers at Muddy Creek, Mary was a Methodist and it was in a crowded Muddy Creek Methodist Church where Mary was given her last farewell. John HUXLEY: Died 21 July 1918 at Portland. John Huxley was born in Portland around 1863. During the 1890s, John travelled to Western Australia, lured by the discovery of gold, but unlike the other July pioneers who chose to seek their fortunes, John struck gold in a big way. John and several other men discovered the rich Londonderry mine at Coolgardie, Western Australia. Having made his fortune, John returned to Victoria and purchased the Straun Estate at Merino. A keen racehorse owner, one of John’s big successes came less than a year before his death, when his horse the Ruralist, trained by James Agnew of Hamilton, won the Great Western Steeplechase at Hamilton in September 1917. The horse was also a two-time Brierly Steeplechase winner at Warrnambool. John passed away at his seaside home Kenly at Portland and was buried at the South Portland cemetery. Christina Emily FORD: Died 26 July 1931 at Hamilton. Christina Ford was born in Macarthur in 1880 into a well-known pioneering family. In 1905, she married William Baker and they moved to Portland and raised nine children. Christina was a keen volunteer for the Portland Football Club and was a member of the Australian Women’s National League. Charles HOLDER: Died 21 July 1922 at Warrnambool. The story of Charles Holder’s life appeared in the Portland Guardian on 28 September 1931, nine years after his death and it gives a great account of Melbourne and Victoria in the 1840s. Charles Holder was born in Bristol, England around 1838 and from the moment he set sail on the Wardshipton as a three-year-old with his parent and siblings, his great pioneering life had begun. The voyage in 1841, with almost 300 other immigrants was harsh with twenty-four deaths including twenty-two children. hree of those children were Charles’ young sisters. Arriving at Hobson’s Bay, Charles, his parents and two remaining siblings, took a steamer along the Yarra River to Melbourne. After spending time on stations around Melbourne, including Dandenong as a boy and young teenager, Charles made his way to the Western District, working at The Gums between Caramut and Penshurst. By that time, it was the early 1850s, and Charles headed to the Bendigo diggings but like so many his luck was out and he returned to the west of the state, working at Grassmere near Warrnambool. In the early 1860s, he selected his own land at Cooramook and remained there for the rest of his life. An obituary in the The Register (Adelaide) on September 2, 1922 , published at the time of Charles’ death has further detail of his pioneering life. Ellen OSBOURNE: Died 15 July 1934 at Hamilton. Born at Portland, Ellen Osbourne married local builder Thomas Cruse and they continued to resided at Portland. She raised a family and was a devoted member of the Church of England. 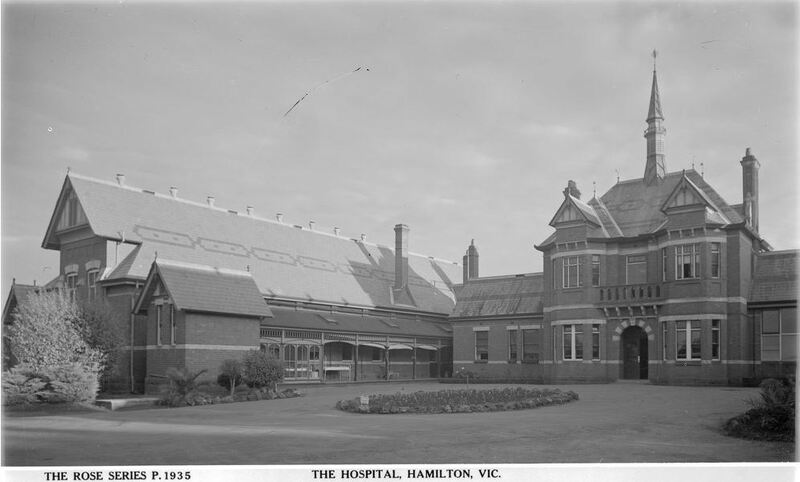 Prior to her death, Ellen had been ill for many weeks and as a consequence was admitted to Kia Ora Private Hospital at Hamilton. Ellen needed a blood transfusion but unlike today when we take for granted stocks of blood at hospitals, in 1934 there wasn’t a Red Cross Blood Bank. Therefore, Ellen’s son donated the blood required for the transfusion. Unfortunately, it was not enough to save his mother. This entry was posted in Pioneer Obituaries and tagged Donnelly, Dunn, Farnham, Ford, Holder, Huxley, Learmonth, McLean, Munro, Murray, Osbourne, Savin, Symons. Bookmark the permalink. Another great Passing of the Pioneers,so much information and so many people who interact with family members, keep up the good work Warren Gamble. Totally fascinating. My ancestors were John Lucas. thomas Rochford. Thanks for your comment Annette. Something I look forward to reading each month. Keep up the good work. Congratulations on all your hard work Merron…you have done so much to preserve the history of the district. Thank you so much Pauline.